Please see the message below from Interfaith Action’s Youth Leadership Program regarding the upcoming “Teenage Interfaith Diversity Education Conference” to be held at Northeastern University in Boston, MA on May 27-29, 2011. Please contact Jason Smith, Youth Program Director, at Jason@ifaction.org with any further questions or requests for additional information. Interfaith Action's Youth Leadership Program presents the fifth annual Teenage Interfaith Diversity Education (TIDE) Conference. The TIDE Conference is organized and led by teens who wish to spread pluralism, increase the impact of teenage voices, and have their presence felt as a positive force in the global community. The three-day conference is planned by fifty high school students of diverse religious and cultural backgrounds, and held at Northeastern University over Memorial Day Weekend, May 27-29, 2011. The goals of the conference are to train teens to communicate respectfully and use their skills in discussions about highly charged issues; develop leadership and facilitation skills; and foster bonds and lasting friendships among the youth in attendance. Conference attendees will participate in workshops, dialogues, and other activities throughout the weekend that allow them to discover more about themselves and their understanding of personal identity; learn about the beliefs and identities of others; and make their voices heard. By the end of the weekend, teens will gain the skills needed to break down religious and ethnic barriers while becoming leaders in their communities. Adults working with teens have the opportunity to attend a parallel but separate adult track at the conference. Many of the conflicts that occur across the world are a result of cultural misunderstandings and a lack of tolerance and leadership. Participation in the TIDE Conference is one leap towards a more harmonious and peaceful world, led by strong individuals who have fostered their skills as teens! The TIDE Conference has been officially designated as a Post-Parliament Event by the Council for a Parliament of the World's Religions (CPWR). The conference is sponsored by Interfaith Action, Inc. in collaboration with the Brudnick Center for the Study of Violence and Conflict at Northeastern University. More information about the conference and how you can register is available at www.ifaction.org . Outside groups and individuals may submit workshop proposals to showcase their work during the Sunday track of the conference. All proposals are due by April 1, 2011. More information about this opportunity may also be found on Interfaith Action's website. Please contact Jason Smith, Youth Program Director, at Jason@ifaction.org with any further questions or requests for additional information. Thursday, February 3rd. Our 4th day, but only a morning work session. The quiet was amazing. I think I only heard three explosions all day! We started the day, as always, with our 7:30 silent meditation in the tea-house. Over breakfast, we talked about travel and immigration and the remarkable and often absurd problems Mexicans have with visiting or immigrating to the US. Margarita left right after breakfast for an annual birthday meeting with high-school friends in Mexico City. She would be back late. * finding a new webmaster after Lance’s contract ends in mid-March. * reviewing the Minutes from our March 2010 Regional Assembly. * reviewing & revamping the Seed Grant process. * exploring outreach to CCs in other Regions sharing themes with Multiregion MCCs. We spent quite a bit of time going through all of the notes from the last three days and listing who was charged with who what tasks when we went home. We started the discussion around finding a new webmaster. Some candidates were identified and specific plans for the website laid out. For one thing, we want to be sure that all of the Regional Team can post to the Multiregion blog and that the public can comment on the posts. We all committed ourselves both to finding material for the blog and to policing the comments to remove the ubiquitous, intrusive Viagra ads, etc. At this point, Jonathan had to take Yoland to Cuernavaca to catch a bus for the airport in Mexico City. Linda checked her email and discovered that her flight home on Continental Airlines had been canceled! There wasn’t much she could do without knowing Spanish as all the folks she called spoke no English. When Jonathan returned, he spent an hour and a half on the phone working things out. Ultimately, Continental switched her to flight tomorrow that will require and overnight in Houston before she gets home, but we’ll leave at the same time tomorrow. 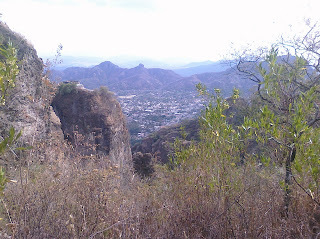 When things had been worked out, Jonathan drove me to the trailhead to begin my hike to the pyramid of Tepozteco. 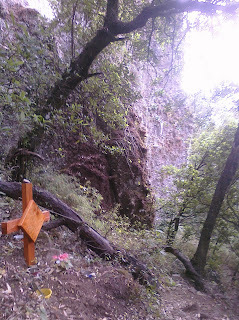 The plan was to approach the pyramid by a shorter route from the town of San Juan on the other side of the mountains above Tepoztlan and then return via the much longer trail from the pyramid down a half-mile in altitude to Tepoztlan. Linda came along for the ride. At the recommendation of a friend of Jonathan’s, we went out of town and into the hills along roads that Jonathan had not traveled before. As we neared the village of San Juan, we stopped to ask villagers the way to the trail. They directed us back down the way we had come, “past the two trees painted blue”. I had a feeling from studying the diorama in the Museum yesterday that this was not correct, but who’s going to argue with locals? With some difficulty, we found the trailhead. Armed with water bottle, flashlight, and cell phone, I set off to find the pyramid while Jonathan and Linda drove back to the Rose hacienda. Contrary to Jonathan’s friend’s directions, the trail, once found, was not well-marked or easy to follow. (The reason would later become apparent.) The way split often with no clear indication of the correct route. One woman I encountered gave me some directions, but my level of proficiency in Spanish meant that I was relying more on her hand-gestures than her words. The dirt road became a trail. The trail became a path. The path became often indistinguishable from a dry-streambed, as indeed it often was. I started using the arrows-made-out-of-broken-twigs tricks that I learned in Cub Scouts to mark the trail back, should it become necessary. I was now about two miles in from the trailhead, and two miles up and the air was noticeably thinner. The pyramid is on the peak to the left of center. With a shock, I realized that I was on the ridge of mountains behind and ABOVE the pyramid, and that a half-mile deep canyon lay between me and it! I had been right and the directions from the locals had been wrong. Had we gone just beyond San Juan there would have been a route following the ridge down to the pyramid and I wouldn’t be in this predicament. I tried to scope a way further up and around to connect to the correct ridge and set off. I found my way out without too much trouble and met Jonathan… just as rain clouds started to gather – another reason it was probably wise to stop when I did. On the way back into town, we passed what appeared to be an occult supply shop. Jonathan said that it would probably be open until 6 pm. We got back to the hacienda at 5 pm. I grabbed a quick shower and change of clothes and headed out to visit and ATM, find the shop to see what they had, and do a little gift-shopping before 6. The shop turned out to be a mix of exotic Hindu stuff imported from India and candles and such for Christian candle magic. I found a shop with some cool items for my wife Anna. Returning by way of the restaurant “El Brujo”, I stopped and called Jonathan to have him and Linda come join me for a last dinner and drink. It featured a fusion of local Mexican and Italian cuisine, and pastries baked on-site. Jonathan had not yet eaten at this place, but it was great! Worthy of at least the 4.5 stars in the online reviews. The owner / master chef was very pleased when Jonathan explained that I am a “brujo” from America! We made our way back to finish up with items on the computer, pack our bags, and write this, the last report on this trip. And so, the first face-to-face meeting of the Regional Leadership Team of the URI’s Multiregion came to a close. 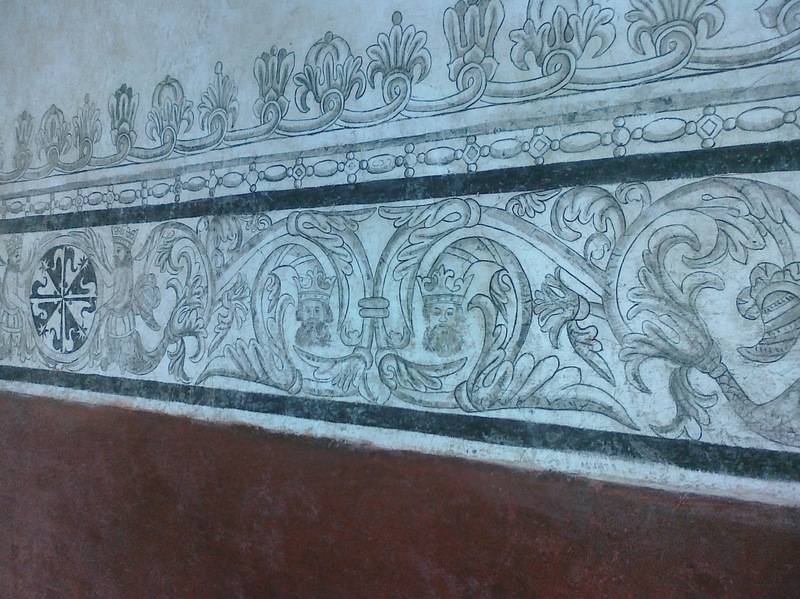 We leave at 8 am tomorrow for the drive to Cuernavaca and the bus-trip to Mexico City. But we won’t have much time to rest… There’s a teleconference of the URI’s Global Council on the 9th. Wednesday, February 2nd. Our 3rd full day of meetings. Candlemas for me, and for the inhabitants of Tepoztlan, who celebrate it as “Candelaria” I can tell that it’s a holy day dedicated to the baby Jesus by the rounds of cannon-fire that wake me from a sound sleep, wondering if the protests in Cairo have spread to this small Mexican hill-town. Of course, it’s not cannon-fire, but rather the largest yield fireworks I have ever encountered, made to explode just above the roof-tops and set off all over the town at random intervals not to exceed a minute and a half. No one here can explain the connection between explosives and the baby Jesus, except to say that it is “costumbre” – custom. We started the day, as always, with our 7:30 am silent (Hah!) meditation in the tea-house. Over breakfast, Margarita explained about the traditions associated with this celebration of the presentation of the baby Jesus in the temple 40 days after his birth. Almost every family has, in the past few days, acquired a doll of the baby Jesus and made elaborate baby clothes in which to dress him. Today, they will bring these dolls to the town’s main church (built in 1580) to have them blessed in a huge outdoor Mass. They will take these dolls home and seat them on little thrones in house-hold shrines for the next year. The whole process is accompanied by feasting, processions, music in the streets, and yes, explosions. Apparently, the bigger the bang, the greater the prestige. We got down to business at about 8:30 am and started with what we thought would be quick items. We discussed a proposal from the Global Healing CC regarding creating a closer relationship between the Multiregion and the United Nations Environmental Programme (UNEP). After much discussion of this and of the Multiregion’s URI-UN CC we decided to ask the Global Healing CC for more detailed information to circulate to our CCs. If there are CCs interested in pursuing the proposal, then the Multiregion Regional Leadership Team (the Trustees and Regional Coordinator) can consider endorsing it. On a related note, we agreed that we need to arrange some communication with the URI-UN CC to talk about more productive collaboration between it and the Regional Support Team. We talked about the thematic MCCs in the Multiregion, that is, CCs that have grouped together around a common concern to form what are called Multiple Cooperation Circles (MCCs). Currently, we have two MCCs: the Women’s Coalition MCC and the Indigenous MCC. We revisited the idea that while other Regions often have sub-Regional Coordinators, the Multiregion might end up needing thematic sub-Coordinators instead. We noted that the description of MCCs in the URI’s Bylaws would allow individuals to members and also other, non-URI groups as well. The promotional material we have talked about creating needs to explain this, and explain to CCs in the other Regions that they can be a CC within their geographic Region AND a member of a Multiregion MCC focused on a theme of common concern AT THE SAME TIME. We need to engage in outreach to CCs in the other Regions around this. We discussed the Seed Grant program (which has provided small grants to Multiregion CCs to help jumpstart projects) and the need to review and revamp the process of application, selection, and evaluation of results. We agreed that we don’t have enough time to do this here, that we can do it in follow-up electronic communications, and that we wouldn’t award any new Grants until we can conduct a review in consultation with the Global Hub Staff. We agreed that we want this to be completed by June. 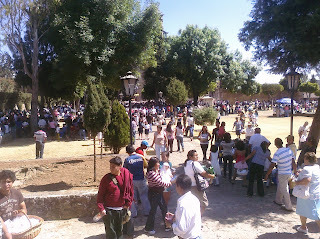 By this time it was 12:30 pm and time to take a break to go see the Candelaria service at the Church. We joined the throng of hundreds, perhaps over a thousand people converging on the church – some playing music, many carrying wrapped dolls. 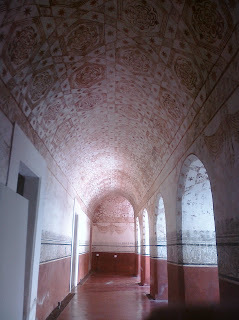 As the service would go on for an hour, we had time to take a peek inside the attached Convento de la Natividad. 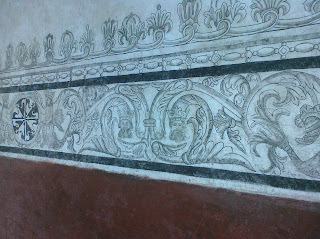 The convent is no longer functioning as one, but its extensive wall-paintings have been restored and the huge building is a historic site, including a museum and bookstore. We went back outside just in time to hear the priest call forward everyone carrying a doll to be blessed. As the crowd surged forward, we slipped out the back. In the large market filling the town square outside the church precinct Jonathan helped Yoland and Linda look for fruits and sweets to buy, while Margarita took me to a book stall she had discovered that she thought would interest me. The stall was small, but filled with the most amazing array of books (in Spanish) on esoteric subjects: the Egyptian Book of the Dead, Understanding Dream Symbols, the Dialogues of Plato, Legends of the Vampires, Feng Shui for Love, Astrology for Success, the Odyssey, Myths of the Greeks & Romans, Islam in Antiquity, Talismans of Black Magic… on and on. I purchased a dictionary of Nahuatl and a Mexican edition of the Necronomicon for my collection! Perhaps the former will help me decipher the latter. ;-) Actually, the Nahuatl / Spanish dictionary is fascinating. Between my basic ability to read simple Spanish and the many pictures, it’s quite easy to pick up Nahuatl words and phrases. A conversation with Margarita helped me understand how to properly accent the words. This will be fun. 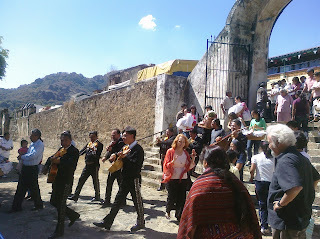 Dodging mariachi bands and processions of doll-bearing women wreathed in the smoke of copal burning in swinging censors, we returned to the Rose hacienda for lunch. Afterwards, we reconvened in what has become the “Multiregion office” – the terrace outside Linda’s room overlooking the Rose’s gardens and under the watchful presence of the pyramid of Tepozteco on the mountain. We reviewed the work we had done the day before on the description of the Regional Coordinator position in the Multiregion and the plan for finding a new one. After a few more tweaks of the language, we had completed something that could be submitted to the Hub for comment. * the creation of a dedicated bank account for the Multiregion. * the idea of a global e-marketplace, selling the crafts produced by many of the members of Multiregion CCs. This had been suggested before in the Global Council of the URI, but the scale of such a venture might be better suited to a Region. * eco-tourism. Yoland brought up how many of the Indigenous in the URI are interested in exploring this. If it was done under the auspices of the Multiregion, both the Region and the Indigenous people would benefit. Everyone on the Global Council has talked for years about the need for the Regions to be financially self-sufficient. We in the Regional Leadership Team had been talking for weeks about committing to moving the Multiregion in that direction. We agreed to start with generating 5% of our planned budget. This is a great place to start since we have already raised more than that. We agreed to commit to raising this percentage each year. We call this “incremental financial autonomy”. Yoland suggest that we state our intention to have another Regional Assembly in March of 2012 (possibly here at Jonathan’s). We all agreed that we should work towards this. I suggested that we ask all of our CCs to consider, if they want to meet face-to-face again NEXT year, contributing some money THIS year to help raise money for such a meeting – perhaps some fraction of what they would have spent to go if the meeting had been this year. We talked again about using the phrase “The Multiregion -- We are the World!” I said that I kept thinking of variations: “We are the World, and the World sings!” for music, “We are the World, and the World loves to eat!” for an interfaith cooking program, etc. I said that I would look into the possible legal ramifications of using the phrase. Linda said that we definitely need to increase youth participation in the Multiregion, with which we all agreed. Linda said that she would ask former-Multiregion Trustee, now-URI-Youth-Coordinator Mathew Youde to consider young people in the URI who might be interested. Reaching then end of another day spent in eight hours of meetings and of our time working together, we closed as we opened – by going through the list of CCs of the Multiregion and appreciating the gifts and skills that each of them brings to the Region. This was a VERY positive experience! We got MUCH more done than we ever could have through phone calls and email, and we built the Multiregion Regional Leadership Team in the process. The Trustees are all VERY thankful to Jonathan and Margarita for opening their lovely home and gardens to us, and for showing us Tepoztlan. Yoland leaves tomorrow morning, while Linda and I both leave on Friday. That gives Linda and me one more day to try to see more of this amazing part of Mexico. Tomorrow, Jonathan and Linda will drive Yoland to Cuernavaca to catch a bus to the airport in Mexico City. Then they will get lunch in and explore the city of Cuernavaca. I plan to be doing something very different. Ever since we arrived, I have been fascinated by the white pyramid of Tepozteco shining on the mountain above us. I am planning to hike up to it tomorrow. Jonathan has called some friends who have confirmed that approaching the pyramid from San Juan will mean a much shorter climb – since the pyramid is almost half a mile higher than Tepoztlan, but San Juan is closer to the top. Also, approaching the pyramid from the San Juan side means that I’ll be in the shade cast by the mountain for the ascent. Then, the half-mile change in altitude will only be for the two-kilometer walk DOWN from the pyramid on the Tepoztlan side of the mountain. The only down-sides of this plan are that we are already at an altitude of 1.5 miles here in Tepoztlan and all of us visiting can feel the relative thinness of the air, and that the trail on the San Juan side is not as well marked and rather hard to find. Jonathan and his friends are trying to arrange for a local to accompany me. I REALLY hope that this works out, since, much to my surprise, when I Googled “Tepozteco” site after site talked about how the hike to this pyramid is one the most fulfilling experiences one can have while traveling in Mexico! Wow! It’s been calling to me since we got here. If all goes well, I’ll celebrate my own Candlemas a day late at the pyramid. It’s almost 1 am, so it’s time to post this and rest up for tomorrow. Today, Tuesday, February 1st, was our second full day of meetings. We started again at 7:30am with meditation in Jonathan's tea-house. Over breakfast, we sang "Happy Birthday" to Jonathan's wife Margarita. Jonathan and Yoland also sang a Spanish birthday song. I didn't know the song but I caught a reference to King David in the lyrics. I asked about this and was told that the lyrics basically said: "King David greeted the morning with this song and since it's your birthday we sing it to you." "How interesting," I said, "a Pagan song masquerading as a Christian one through a Biblical reference." When they asked what I meant, I said that there wasn't anything obvious to connect the two parts of the song except that they were both addressing beginnings or times of "birth" -- of the person and of the day. King David's song was clearly a Pagan hymn of praise addressing the rebirth of the Sun every day, but since David had done it, that made it "kosher". 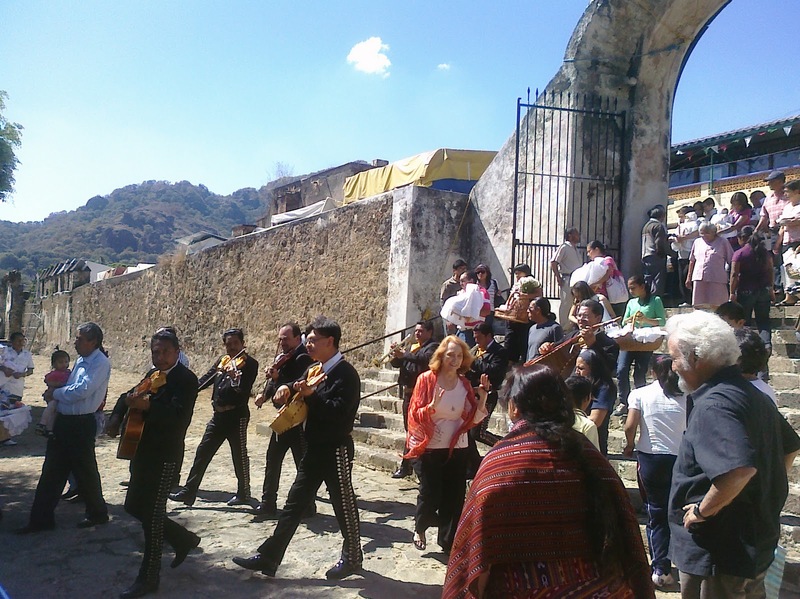 Margarita also sang the King David song in Nahuatl, the language of the local people. She mentioned that the suffix "-ita" or "-ito" in Nahuatl signified royalty. When she and Jonathan first met and all of his friends called him "Jon", she took to calling him "Athon" as a pet name. Over time, this became the more endearing"Athoncito", which we sometimes hear her call him. :-) We got into a discussion of how my name -- "Don" -- had been misunderstood in Latin American countries as being my title, and how this had led to assumptions about status that had interfered with building relationships. Several suggestions were made for alternatives. "Donquito", in imitation of Athoncito, was ruled out since it means "little donkey" in Spanish. Margarita suggested basing something on my middle name -- "Hudson" -- possibly "Sonso", which is fine in Nahuatl, but means "stupid" in Spanish. I wasn't having much luck until Jonathan pointed out that the longer form of my name in Spanish -- "Donaldo" -- is not as unusual as it used to be since there had recently been a Presidential candidate with that name (the only "Donaldo" he had ever heard of). "Donaldo" it shall be, then, in future introductions. "We use the term trustee in its truest sense: URI Trustees carry the trust of the entire global URI membership, charged with representing their interests in the larger body. The Trustees of URI are exemplary leaders who manifest the vision and values of the Preamble, Purpose and Principles through their actions, and have a deep commitment to serve the whole of the URI community." Wow! That's a lot to try to live up to, and we all felt the weight of that responsibility in approaching our deliberations. We reviewed the Narrative Report covering what had been accomplished in the Multiregion from mid-November 2010 to the end of December, prepared by Jonathan as Regional Coordinator (RC) and submitted to Charles as Executive Director. We also reviewed the Work Plan for the Multiregion for the first three months of 2011 in terms of Goals (Services provided to the CCs) and Intended Results (Intended Accomplishments by CCs) and worked out detailed steps to take to achieve the Goals. We looked at shared governance in the Multiregion, nurturing of CCs, and our Seed Grant program. We divided tasks into what could be accomplished in the three month period and what should be considered in terms of "deeper time" or more long-range goals of the Multiregion. * The Trustees agreed to assist the RC and Webmaster in the collection of news and stories from the CCs for inclusion on the website (www.urimulti.org). * We agreed that the Multiregion, more than any other Region, has an ethical obligation to be bilingual and that we commit to working towards all of our materials being available in both English and Spanish. The idea was floated of a "Translators CC" of folks who might be interested in providing translation assistance within the URI. * We realized that the Multiregion doesn't have a representative on the CC Approval Committee and agreed that Linda would be our person on that Committee (which is supposed to include one Trustee from each Region). Before lunch, we started working on the requirements for a new, permanent Regional Coordinator. We started by reviewing the input sent to us before this meeting from many of the Multiregion CCs with their thoughts on what qualities and skills were necessary in a Mutiregion RC. We took to heart the URI's Manual of Standard Policies and Practices for Regional Development and let it be our guide through this process as we worked out the steps through which the Regional Leadership Team and the Hub Staff could work together to create a new RC position, announce it, evaluate applicants, and make a decision. For lunch, we went out to a local restaurant to celebrate Margarita's birthday. I had "cecina", a beef dish native to the area in which the beef is sliced very thin and cooked in a process resulting in something that tastes a bit like beef jerky, but is moist and tender. On the way back to the Rose hacienda, I noticed several palm and card readers, a store selling Tarot decks and crystals, and a restaurant called "El Brujo" that is a 4.5 star place! I'll try to stop in there before I leave on Friday. Jonathan said that "brujo" is not a derogatory or negative word locally and would be how they would translate "Witch" in the way WE mean it. Tepoztlan is an interesting town. After lunch, Jonathan and Linda worked on incorporating the fruits of our discussion into the exiting URI document on identifying and selecting a Regional Coordinator. They focused on the qualities we would look for in applicants while I worked on another computer on revising the description of the Multiregion. Yoland took some time out from Multiregion work to catch up on other, pressing URI email. We reconvened around 5:30 to compare notes and finalize our plans for tomorrow. By 8pm, we were getting a bit fuzzy in the head and joined Margarita in the kitchen for some coffee and "pan dulce". Today we worked about nine and a half hours and we were getting a bit fried. We called it a night and I came back to the room to get a shower, make some corrections to yesterday's post, and write tonight's report. While I worked, I turned on the TV in my room for the first time to find "Practical Magic" playing in Spanish! Well, it's 1am. I seem to be getting back into me usual reporting pattern. Time to get some rest before morning meditations.